This unit gets two thumbs up from field users! The Geoprobe Model 540B, one of Geoprobe's most versatile utility units, has all of the standard features of its truck cousins, but uses a compact, skid-steer loader as the carrier/power source. It's small enough for tight places, but heavy enough for tough probing. 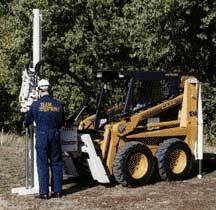 It's a great unit for rough terrain and limited access probing. It has all the movement features of truck-mounted Geoprobe machines, including hydraulic extension in and out from the carrier unit, hydraulic tilt for angle probing, and power lateral movement. The Model 540B comes equipped with remote ignition and hydraulic quick connects for easy connection to the unit's hydraulics. All movements present on truck-mounted Geoprobe machines, including hydraulic extension in and out from the carrier unit, hydraulic tilt for angle probing, and power lateral movement. 25,000 pounds (111kN) pulling capacity, the pulling power you'll need for today's deep probing projects. Longer stroke affords additional space under the probe shell for using longer probe rods and for attaching and removing tools. Equipped with GH-40 Soil Probing Hammer. Direct slide lateral movement for offset placement of probes. Rear stabilization outriggers. . . standard equipment. Hydraulic power from skid-steer power components. Versatile mounting capabilities. Unit does not require full-time dedication to carrier vehicle and can easily be shipped to location. Probe-Lease, 841 Thomas Rd., Ponoma, KS 66076. Tel: 800-645-2009; Fax: 785-255-4430.